Samantha August has been kidnapped by aliens and they weren’t subtle about it. They took her in a blinding flash of light on a busy street during the day time. Everyone saw it whether they were there or watched the footage later on YouTube. Because these aliens aren’t messing around. They’ve watched us from afar, destroying our planet and hurting one another, and decided direct intervention is needed to protect the biosphere. So, they will save our planet and Sam is to mediate between us, because as far as they’re concerned, our earth is the priority, we’re the disease that has to be immunised against. 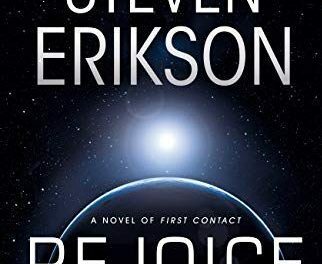 The premise of this book is fascinating, examining the human hubris that if beings from other planets did make contact they would want to talk to us. 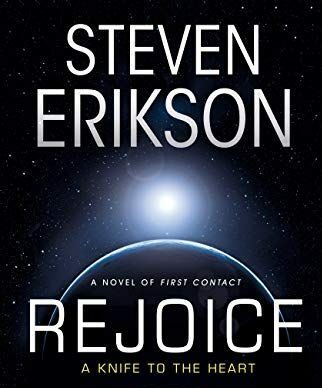 In Rejoice, the aliens make contact through an AI known as Adam who monitors Earth and is responsible for its restoration. In the first instance, Adam creates human free zones where nature can repair itself without our interference. In the second, Adam prevents humans from committing violence against one another by using forcefields to stop blows landing. However, I couldn’t really get into it. There is very little emotional drive in the book. Adam’s no-violence rule hits just in time to save a woman from fighting with her abusive husband, but I didn’t feel relief or happiness for her because she didn’t feel it herself. Most of the repeating characters have positions in government or the media where they don’t feel the consequences of Adam’s restrictions on humanity. The characters also accept what is happening with relative ease. Even the gun runner, Casper, just walks away from a substantial haul of weapons because he thinks he’s out of business after only the first attempt. Then he has a crisis of conscious about his past life. The message is we as a species are redeemable. But the myriad of personalities on this planet means not everyone could accept the new order so peaceably. I hungered to see people testing Adam’s rules because, if we’re honest, that’s what people would do. There is a lot of dialogue without prompts to guide you on who is speaking, and I felt many of the characters sounded the same. There was little difference between Sam talking to Adam about the future of humanity, and Sam’s husband and her friend talking about the aliens’ motivation. These large sections of dialogues listing humanity’s faults when it comes to looking after our planet, along with segments from Sam’s vlog, come across as preachy, making it very hard for me to get drawn in. This book wasn’t for me, I agree with the sentiment, but the delivery didn’t hook me. 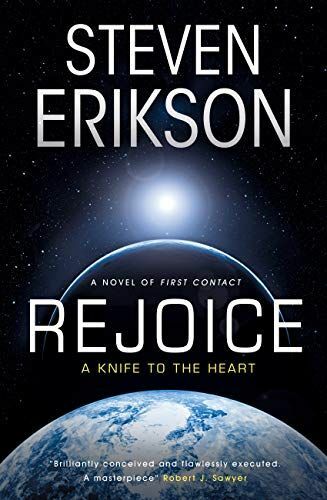 Maybe I would have enjoyed it more had Erikson presented this as an essay rather than a piece of fiction.